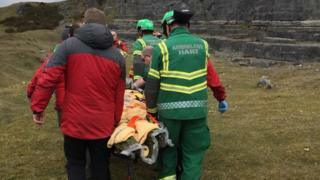 A man suffered "significant" injuries after the off-road bike he was riding accidentally went over a 30ft quarry cliff. Central Beacons Mountain Rescue Team (CBMRT) said it was called to the scene near Merthyr Tydfil at about 12:30 BST on Sunday. It said the man's friends helped to guide rescue teams to the scene and supported when needed. Paramedics treated him before he was airlifted to hospital.